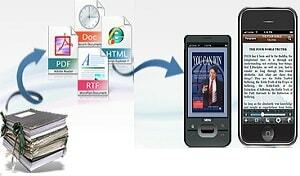 Our Mobile E-Publishing services encompass migration of content from almost any format to digital format. *A fully hosted mobile e-publishing solution that can automatically render content to a mobile device based on device characteristics. *Have your publication available to millions of people all over the world through your very own branded app. *Truly digital E-Publications to optimize your content including text, image, video and audio, across 100% of your site for your Mobile Web users. Traditional paper publications are considered proactive and focused mediums as they are delivered directly to the hands of the user. But while effective, they are notoriously expensive due to paper and postage costs today. SoftR Infotech offers Mobile E-Publishing Services that encompass migration of content from almost any format to digital format. Our mobile publishing team is equipped to deliver all types of services and solutions for the print, online and media domains. Our Mobile E-Publishing services permits our clients to instantly create and proactively distribute their easy-to-read ‘Digital Editions’ – simply using the internet as transport to the user (via email, URL link or accessed from the client’s website) – for viewing in Online, Offline and Mobile modes; anywhere, anytime..